I was feeling a little more country than rock and roll today, as I was tilling the garden and planting peas. I wonder how many pies have sat on that sill in the 200 years this house has been here. This is the original farmhouse for the entire county. Those early cooks will have baked theirs in the hearth. Did they wrap the pies in cloth to be eaten at break time? After pulling stumps and urging the horse to pull the plow through the soil, it must have been wonderful to rest a bit and pull that pie out a pocket for a pick me up. Eventually our cooks would have looked out on the little Anglican church, built by the men in the growing community. My method won't be much different from our early bakers. 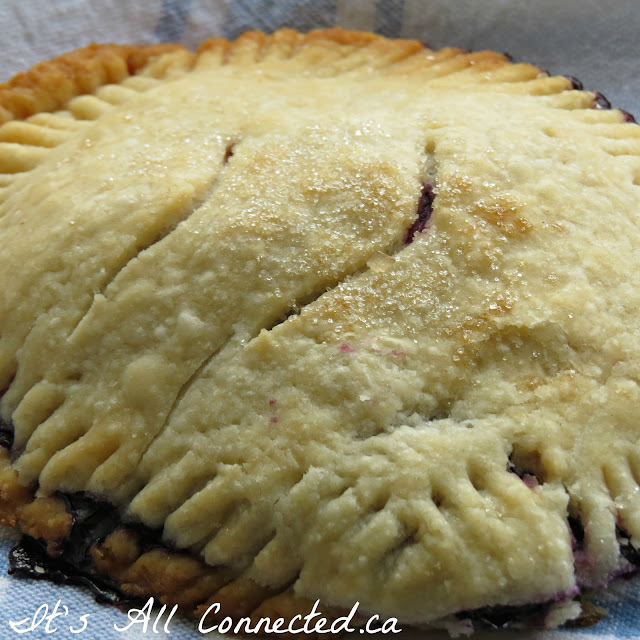 The pastry is made from scratch and the blueberries came from a local, organic farm. A little extra flour added to the berries makes the filling less runny and easier to take to the fields. A sprinkle of sugar on top would certainly have been a luxury 200 years ago. I wouldn't mind having that good, old horse to help me with my work, right about now! What??? No recipe for the pocket pies??? Blueberry is my favorite! I'm glad you are enjoying some good weather. We have snow today. First time we've had snow in May since 1925. If you need more rocks...I have plenty! Hi Maureen...thanks for visiting my blog! Your blog is so interesting. I can smell the blue berry pies! Where do you live? I can see why your would secretly want to be Tasha Tudor...lol! Oh YUM! Those pies look amazing! Maureen! How could it be so long since I last visited? I shall have to be more diligent about making sure I pop by more often. Have a wonderful weekend and don't hurt yourself with that heavy yard work. What a gorgeous place to live...Oh I just love it and pies on the window cooling. Goodness I can smell them from here! What an amazing view you have. 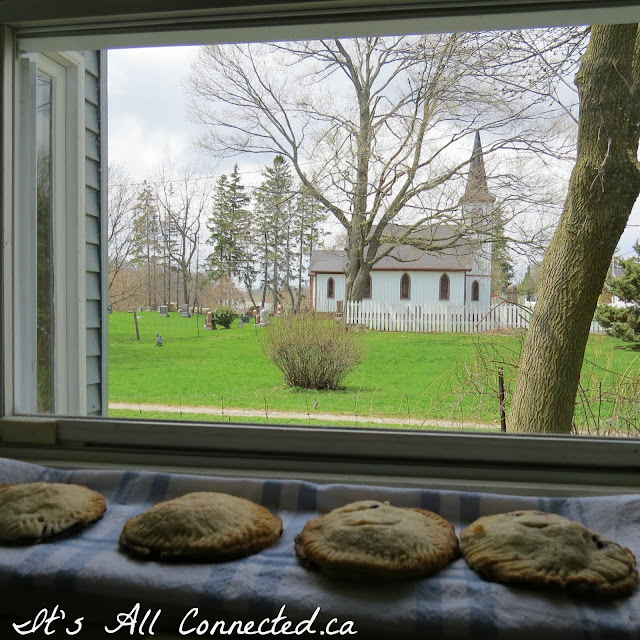 Oh pies on the windowsill look amazing! The pies in the window could not be any prettier. To look on that sweet church every day would be very peaceful to me. I am a country girl so I love your place Maureen. Those look wonderful. I love pocket pies and also working in the yard! There's just something great out working the dirt with your own hands. Have not heard the term pocket pie -- they look adorable cooling on your windowsill. Got to love the view out your kitchen window! :D SO pretty!! Lovely little pies, too....yum! The little church in the distance is lovely. The pocket pies look so delicious. 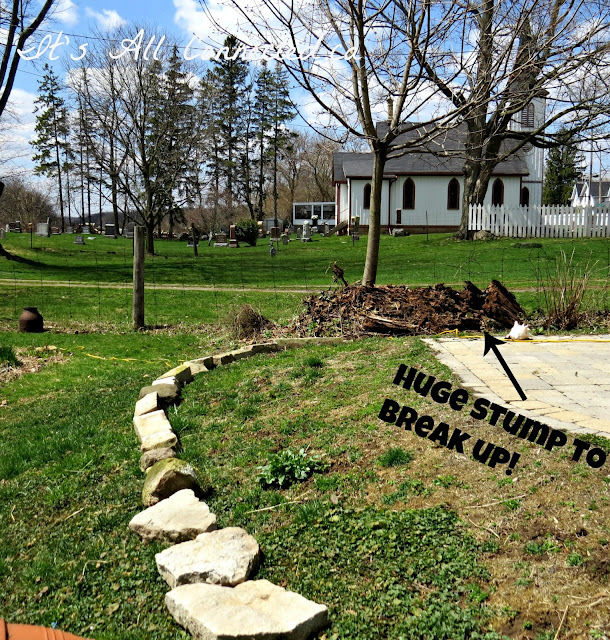 Good luck with the stump removal and the terraces. Marie, grab Donnie and bring me some of those pies! Pocket pies? Oh I have to try this. I am a huge fan of blueberry but I bet these are good with raspberries too! Those pies on the windowsill are like the best thing i have seen all year. I LOVE that photo. And YOU'RE digging up that stump by yourself!? That thing is a HOG! oh my gosh... I love the pattern you are laying out with the stones too... You're amazing! That photo of the pies is just too charming for words - and the history lesson is fabulous too! Those pies look great, and I love the view of the pretty church. Good Morning Maureen, What a beautiful view you have from your kitchen window. The church is so very pretty..... and the pies look delicious. I love home made pastry, there is such a difference in taste from pastry bought at the shop. Gosh, you worked hard breaking that stump, but what a triumph now it is all finished, you can get on and design your garden, which is always the best bit. Blueberry pies on window sills, cooling in the spring breeze...in the gorgeous Ontario countryside...delicious!! I am very happy to read this.This is the kind of manual that needs to be given and not the random misinformation that's at the other blogs. Appreciate your sharing this best doc. He's A Good Old Cat! I Can't Believe They Want Jell-O!